Once upon a time, the Boston brunch landscape was as bleak as the Bambino-cursed Red Sox. Thankfully times have changed on both fronts (right, Mookie? ), and many Hub restaurants are going full throttle with their “whenever you wake up” weekend feasts. 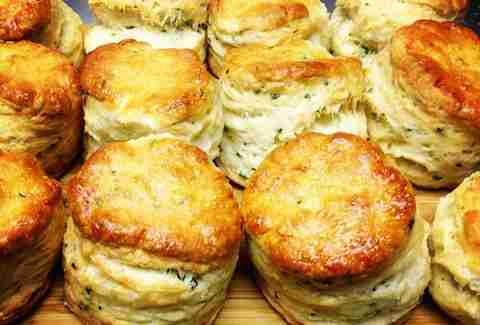 From retooled favorites, to new brunches on the block, here are 10 irresistible reasons to roll out of bed. Enjoy Parisian bistro flavors without leaving the Hub at Bastille Kitchen’s newly launched Sunday brunch. 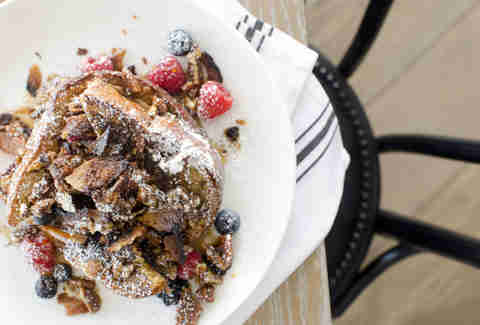 The bacon pecan caramel French toast is as indulgent as it sounds, as are the glazed cinnamon-sugar mini croissants. 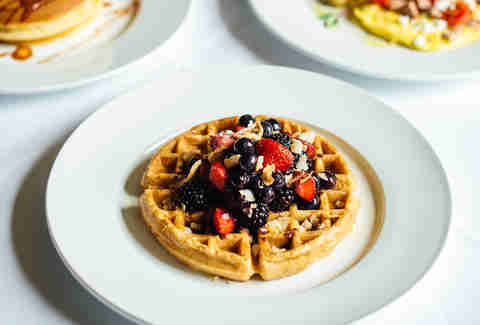 Bastille is also crisping up authentic Belgian waffles crowned with fresh fruit, Chantilly, and Vermont maple syrup for good measure. 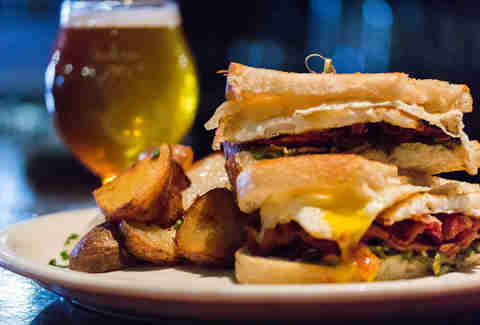 However, the must-have munchie is the pork belly croque madame made memorable by bacon jam and Gruyere. People cried real tears when The Blue Room ended its epic brunch, but sister/neighbor Belly now carries the torch with its Big Easy-style Sunday Funday. Beignets and NOLA chicory coffee set the classic tone, while The Hunter board trends funky with Biellese speck and pork belly rillette. The French Quarter comes alive in the Frittata For One (savory shallot confit, Gruyere), and the chicken-fried steak comes Deep South-style with sausage gravy and biscuits. 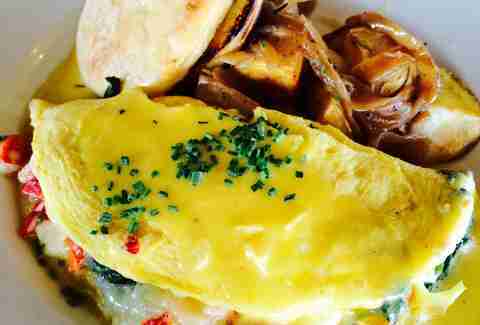 Davio’s fans rejoice as the Arlington St mainstay offers Sunday brunch for the first time... EVER (about time, right?)! 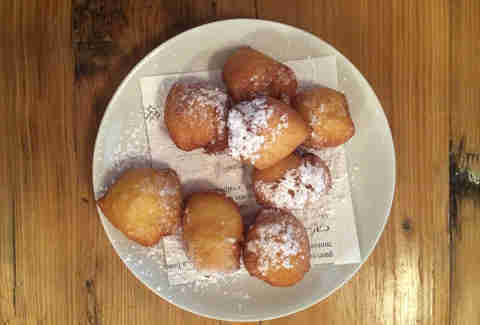 The Northern Italian spread hits all the right notes with confections like warm apple zeppole with Calvados caramel sauce, and the five impressive spring rolls (e.g. chicken parm) suitable for sharing. The spaghettini carbonara is the real deal, made properly with eggs, pancetta, and Parmigiano. Or you can really celebrate your morning with the petite ribeye alongside poached eggs, and potatoes and covered with truffle hollandaise. Elephant Walk takes you on a trip around the world with its recently debuted all-weekend multicultural mashup brunch. 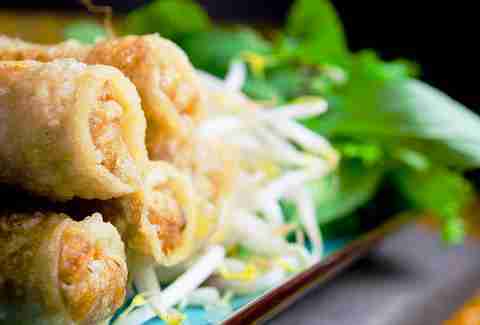 Every meal at Elephant walk begins with its signature crispy Cambodian spring rolls. Mandatory. If you seek savory, Oeufs Brouilles au Kapik Khing is a cage-free scramble mixed with slow-cooked/ Khmer-spiced PT Farm pork belly. On the flipside, the Pain Perdu is all about the sweet with brioche French toast covered in Wood’s Cider Mills cinnamon cider maple syrup. Amesbury’s newest hot spot, No. 8 Kitchen & Spirits, is 100 percent worth the short drive for its Saturday/Sunday brunch. You need several orders of the peppery No. 8 bacon for the table, in addition to the corn bread baked in an iron skillet. For the very hungry, duck confit hash is a belly-buster with two poached eggs and potatoes topped with sriracha hollandaise. To keep things easy like Sunday morning, sip the No. 8 gin & tonic (Brockmans, grapefruit-lavender bitters, Prosecco). 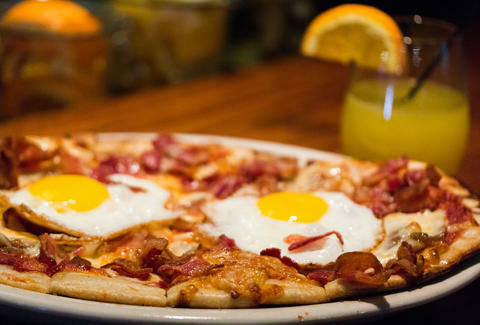 Olde Magoun’s Saloon knows exactly what you need on Saturdays and Sundays: a hearty brunch overflowing with rib-sticking grub and potent hangover helpers. It has Bloody Marys galore, inventive hair-of-the-dog sippers, and many spiked coffee drinks. Once you’re semi-functional, slam The Cure sandwich for all of its bacon, egg, cheese, and roasted jalapeno glory. Or combine your Irish faves in Jameson Soaked French toast smothered in Magner’s glazed apples and Baileys whipped cream. There’s nothing better than brunching by the ocean, and Pier 6 has both a stellar panorama and line-up of fare. First you need a Dirty Texan made with Tito’s and revved up via pepperoncini juice, and bleu cheese olives. Then ease into your day with sweet and sticky wings, followed by your main course, The Maine Omelet. This homage to “Vacationland” is loaded with lobster and spinach, and dashed with hollandaise. The brunch is available on Saturdays AND Sundays, but it doesn't take reservations (walk-in only). State Park breaks down brunch into 3.5 perfectly simple categories: Hangry Menu, Eggs, Not Eggs, and Sides. The Hangry is full of richness thanks to the Everything scone and coffee cake muffin. 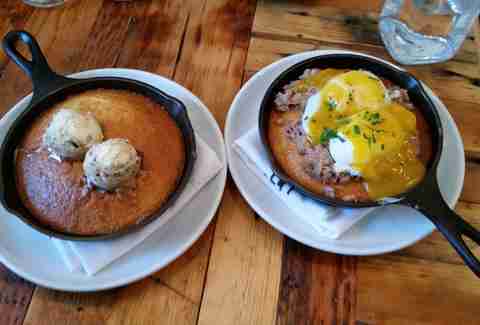 The Urban Lumberjack (pork chop pancakes, two eggs) anchors the Eggs options. Add a side of foie gras to anything (umm, everything!) for only $12. Then there’s the supreme drink options : pitchers of Fernet & Cola, Pimm’s Cup, and/or Tom Collins. Stephanie’s on Newbury just renovated and re-launched, and brunch is better than ever... which might be hard to imagine. Upon arrival, immediately order the Build Your Own Delicious Bloody Mary, and the cinnamon monkey bread drizzled with icing. Then go for the skillet breakfast, a hearty meal piled high with applewood smoked bacon, maple sausage, home fries, eggs, and cheddar. 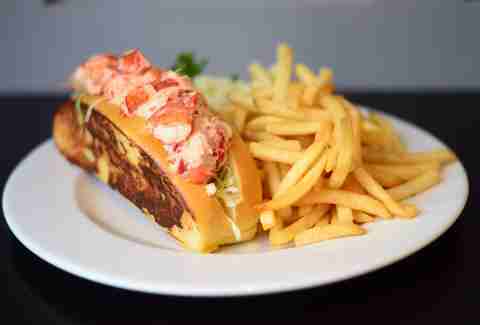 Find buttery perfection in the lobster salad roll, fresh Maine lobster meat on a toasted roll. 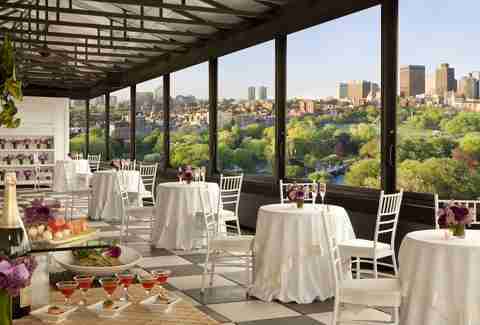 The popular Rooftop Sunday Brunch is back for the season at Taj Boston, and the treats are as sweet as the view. The menu changes weekly, but you’ll likely encounter a vast selection of made-to-order omelets and waffles, chilled seafood, artisan cheeses, Mediterranean charcuterie, fresh pastas, a raw bar, and a roasted ribeye carving station. In the decadence department, the brunch features an artistic dessert buffet for your morning sugar overload. And dessert fantasies. There are four seatings every Sunday, secure your spots here.